Veheragala is a small cave temple 15 km east of Mihintale. Actually, it’s a typical Sri Lankan temple with a stupa, Bo-Tree and an image house in a rock shelter plus some ancient ponds and small bathes. However, there is something special about Veheragala: It’s the finding place of a gold treasure in a literal sense. And the small ancient statues found here were not only golden but of highest artistic value. Surprisingly, they were Mahayana statues in the heartland of Theravada Buddhism. The most precious figures are now for safekeeping in the National Museum in Colombo. One lovely sitting Bodhisattva Avalokiteshvara found in Veheragala is of particular interest, as it has become iconic and emblematic. It can be seen in many tourist broschures. 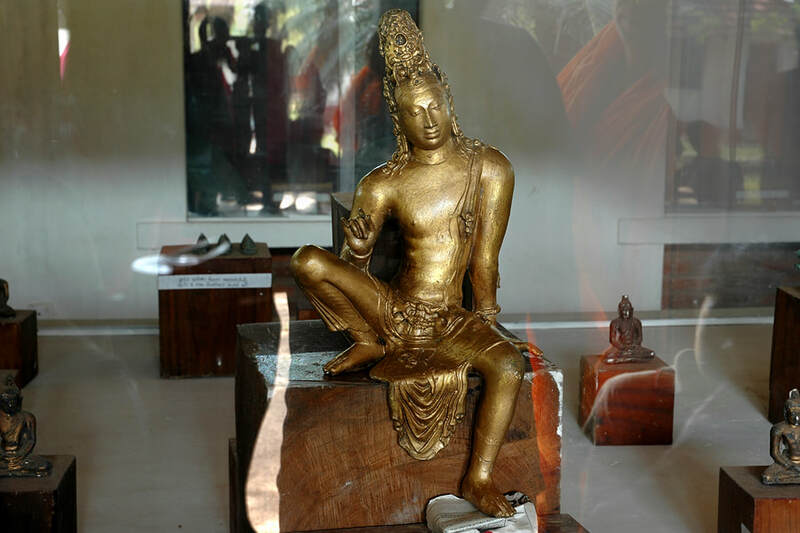 Though the golden sculpture is on display in Colombo, a copy is exhibited right in the middle of the small museum attached to the temple in Veheragala, only 50 m or so away from the finding place which will be shown to you by a monk or assistant.